In Search of My Mother's Garden: "Decoration Day Road Trip"
My family celebrates Decoration Day on the third Sunday of May at the United Methodist Church in Fairview, Alabama. Decoration Day is an antebellum tradition — a party in a graveyard. A Southern version of Mexico's Day of the Dead, if you will. Traditions vary from family to family, but typically relatives gather at the cemetery of their ancestors on a Sunday in late spring or summer. The grounds have been mowed and manicured to that flowers can be placed on the graves. Prayers are said, hymns are sung and a "pot luck" dinner is held on the grounds and a collection plate passed around to help pay for the upkeep of the cemetery. Alan Jabbour, a folklorist and co-author of the newly released book"Decoration Day in the Mountains" (The University of North Carolina Press, $35), says the Southern tradition serves multiple purposes: making sure cemeteries are maintained, honoring ancestors and, most importantly, bringing family and friends together. It's a common belief that Northerners came up with the idea for Memorial Day, but Jabbour says the national holiday was actually "borrowed" from Decoration Day. In his book, he writes that Mary Logan, the wife of Union Gen. John A. Logan, went to Blandford Cemetery in Petersburg, Va., after the war and saw graves of Confederate soldiers decorated with flowers and flags. She told her husband about the display. He was so touched by the idea that he ordered Union veterans to decorate the graves of their fallen comrades. "A Richmond paper bemoaned that Northerners were stealing a hallowed Southern tradition, and a Philadelphia paper complained that the North was imitating a Rebel practice," Jabbour said. (a gracious way of saying "Damn Yankees") It was the beginning of Memorial Day as we know it." In its heyday, Decoration Day was a grand occasion. Before silk flowers became widely available, women made flowers out of colored tissue paper and dipped them in wax so they would last. Dresses, hats and gloves were standard attire. Over the years the turnout for Decoration has dwindled, mainly because the younger generation doesn't come back. When I was a child it was not an option, you went. For several years now my wife and I have meet my sister on Saturday the day before Decoration to place the flowers on the graves. We take some pictures then have lunch at the All-Steak Restaurant in Cullman. The Strawberry Festival happens to be the same weekend, so we usually stop and purchase some strawberries to support the local growers. This year the ritual continued but with a twist. My niece had surgery recently so my sister was unable to meet us at the cemetery. Cynthia and I went to the All-Steak had a delicious lunch topped off by their famous orange rolls, then headed out to the cemetery. After arranging the flowers on the graves, we drove up the road a short distance to take some pictures of a yard I saw on the way to the cemetery. The whole front yard was filled with Japanese Maples, the most I had ever seen. There were so many you could not even see the house from the highway. We stopped at the house and noticed a sign stating that he had trees for sale. We called the number on the sign but no one answered. Not wanting to trespass, I took some photos from the driveway showing the unbelievable number and variety of Japanese Maples. We then traveled to the Burk's farm produce stand and purchased some strawberries, then parted ways. Cynthia headed to Cullman for a meeting at the Presbyterian Church, while I traveled to Decatur to visit my sister and niece. I planned on spending the night at my sister's then travel to Florence the next day to tour the garden of Phillip Oliver of the Dirt Therapy blog. Sunday morning came and the heavens opened. I checked the weather forecast for the Florence area which called for rain and thunder storms for most of the day. I emailed Phillip to express my regrets that I would not be able to tour his garden and ask if I might see the garden under more favorable circumstances. In the process of sending the email, I received one from Phillip saying in was flooding in Florence and today would not be a good day to see the garden. 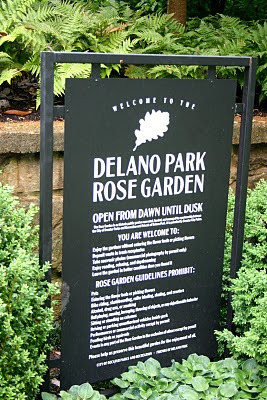 He graciously invited me to see his garden at a later date, which I hope to do in the near future. Disappointed that I would not be able to see Phillip's garden I prepared to return home. 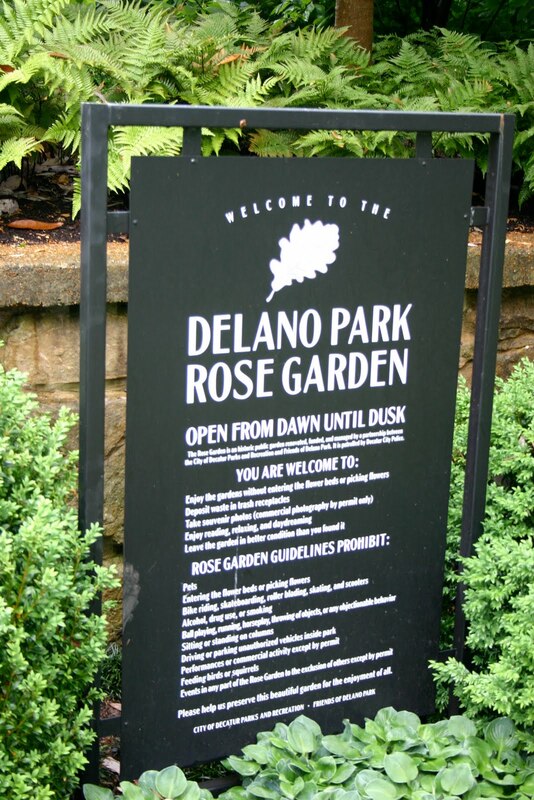 My niece suggested that I go by the Delano Rose Garden at Delano Park in Decatur. I was only about two blocks from her home, so off I went. It is a spectacular garden, classic in design with some of the largest hostas I have ever seen.